In a bowl mix the butter, sugar, vanilla, milk and eggs. Add flour, baking powder and baking soda. Finally add the frozen blueberries and mix. Preheat oven to 180 °celsius. Fill the paper cases 3/4parts and place them in a muffin pan. Bake for about 20 to 25 minutes until lightly browned and dry. In a large bowl, beat cream cheese until it is softened and uniform. Add whipped cream and beat together until it is uniform. Add pulverized blueberries, then sugar to the mixture and mix. Add more sugar if necessary. Mix again until mixture is creamy and spreadable. Set aside in fridge by 20 minutes. 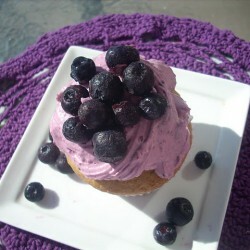 Pipe the cupcakes with the frosting and garnish with some blueberries.